Dr C.F. Black is the Indigenous Scholar in Residence at the Melbourne Law School. She is also an Associate Professor adjunct to the Griffith University Centre for Coastal Management. The centre is situated on the traditional homelands of the Kombumerri. 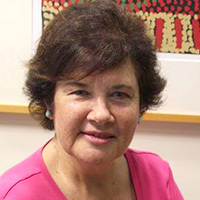 Dr Black is a descendant of both the Kombumerri and Munaljahlai peoples. Whilst at the Melbourne Law School She has a PhD from the Griffith Law School. Her thesis focused on bringing forth the concept of Indigenous Jurisprudence in the Australian context. Black has made story her ‘legal structure’ in which to convey knowledge pertinent to the understanding that the Land (Earth) as the source of the law, as juxtaposed to the Common Law concept of land as property. She has published two Routledge publications: C.F. Black The Land is the Source of the Law: A Dialogic Encounter with an Indigenous Jurisprudence (Routledge, 2011) and A Mosaic of Indigenous Legal Thought: Legendary Tales and Other Writings (Routledge, 2017). A future publication with Routledge will take this same legal stand point to discuss the ethics of Autonomous Algorithmic decision-making systems (AADMS) through the lens of mythology and ancient stories. Her teaching at the Law School is with Shaun McVeigh -Changing the Narrative of Law, AI and Jurisprudence. She is also developing research with Native American and South American colleagues around the understanding of plant consciousness and the role of plants in Indigenous societies as knowledge holders. Her first publication on the issue is On Lives Lived with Law: Land as Healer, (Law, Text Culture Jl.) This publication has led to invitations to be co-editor a special journal edition for Tabula Rasa Jl on the subject and co convening an international workshop on the issue at UC Davis, USA. Her key research areas: Indigenous Jurisprudence, ethical issues relating Artificial Intelligence and other related technology, landscape and plant consciousness.